Met with paddy in his office and discussed updates so far. Paddy wants to see something tangible by next week’s update – i.e. a worked example of how vector clocks will work in terms of location. Suggested storing temporal information (parallel vector clocks?) – e.g. a from to, so that we can say things like does this time overlap this one, is it contained withing etc. etc. Also thought about how to define location – the bounding of the location gives an experimentation thing – change the grid size – whats the computation impact of the size of the grid – and what the relevance e.g. too big and it makes realistic. Construct vector stamps – 5 separate path across these locations, two or three allow drop messages – run through and pick various vector clocks at various times, and show them. Then start generalising them. From this we can draw general things about e.g. : decisions made, what information is stored, what we put in vector clocks, what operators we need. Then run a simulation and see if generalisation works. Then we can see if some things fall down, and come back and change things. Should stick with ideas about location, not proximity yet. Using this it is then possible to write this concisely. Had a meeting with Paddy for me to pitch my ideas. Knowledge of proximity and location makes opportunistic routing more efficient than proximity alone. Proximity and Mobility can be used independantly to achieve the same efficiency in oppotunistic networking. Mobility or Proximity can be discounted when planning opportunistic networking algorithms. Any given node will only need to communicate with with other nodes that they know (friends), or want to know (friends of friends). Range – how many hops away – build a knowledge about the network using information in the vector clocks – how do you do that? This is a PhD part. How do we determine the important nodes? – the Aaron Quigley effect. Nodes in your ball of radius = sphere of interest = friends, +1 hop = friends of friends, +1 = everyone else. Dig out reviews on DTN’s – especially patterns – but paddy thinks that the notion of location and proximity have never been used, but the patterning structures e.g. highly important update nodes. So i need to look at ways of discovering special nodes. How do they determine that . Location thing seems to be different- find a review. Mobility as opposed to location – gives your prediction element. Limit the range of forward projection. Email GW to see if he can get a public dataset. – sign over under NDA? Email Barry Smith to see if he knows of any datasets we can use. – Vodaphone dataset? Email Aaron Quigley – he will know if there is any publicly available – his masters student has access to a corporate travel dataset. Also – see Simons Paper about location. Email knox to see what datasets he might have. Is it a novel implemenation mech. – i.e. am I going to use vector clocks in this thing. I want to make a prototype. – paddy likes the idea – there are some hard questions – some novelty in there. This parts Understanding how to frame solid hypothesis. reading reviews. building exp structure, breaking out a few bits – vector clocks, heuristics about making decisions, how it all fits together. We can turn the VC thing on its head, and make it useful for proximity and location. Need to be careful not to spend too much time comparing to existing things if they are not really related. Important thing is does it matter where you are when I pass you a message – as proximity and mobility are the same – do I pass it to you because i know you see that person, or because I know you will be in the same location as that person. Nodes can predict their own positions – share this information with other nodes – paddy suggested sharing based on the types of people – e.g. friends get detailed info, FOAF get obfuscated location, others get much broader information. Does a node do calculations about other nodes, or does it ask the other node – can you get this to this person? A little but like Agent systems? Then we can say we of course can encrypt this information. Paddy felt that vector clocks etc. that are used to encode e.g. double vecotr cocoks location mobility, is a solid piece of work, and if it gets into a good conference, then it is my PhD. It will need a Order of computaion section with a complexity analysis i.e. is it N^N, Nlog(N), N^2, N^3 – dont go much beyond that – need to analyse the algorithms at the end. well travelled ground about what the complexity of vector clocks is. I want to Nail down what these metrics in the system are, then implement CAR using these metrics as well as coming up with my own algorithm. 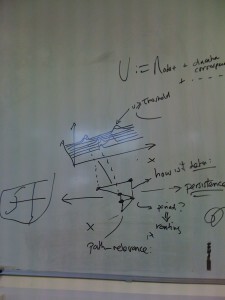 Need to convince Paddy what algorithms/datasets to compare with, there needs to be a good rationale be behind it. Hypotheis section is good – but must refine and remove negative ones – it should keep the positive ones, and prove one thing true or false – pick the one we think is most likely. Add another hypothesis that low complexity algorithms based on vecotr clocks (30:24) can be used. Tighten up – look at knox Hyp section. – and write a halfpage hypothesis introduction and a one/two line hypothesis at the end. Can we use Barabasi way to generate new dataset – almost reverse engineer their preditions, and try to get a dataset based on it? e.g. Random graph of streets for dublin, randomly place nodes – simulator and start to make locations as the predictions. Paddy said that if his EU grants get signed off, he will garauntee me another 1 year of funding from September, the only requirements will be a chunk of work which results in a ~30 page document – something to do with autonomous software patching. Also spoke to him about the idea of Vector clocks and how we can use them for opportunisic networking – he wondered whether we could derive some utility for locations, perhaps based on duration spent at a location, number of nodes in that location etc. etc. He said that perhaps a good paper would be on techniques for analysing locations for use with opportunistic networking. Paddy said that he wants me to aim to submit to CfP on Social Based Routing in Mobile and Delay Tolerent Nets the deadline is in June, and split the time up until then into 6 week chunks, and for the first chunk, tell him what I will be doing – i.e. what problems I am solving, and for the whole time, what my goals are. Also spoke about my idea for using the Dublin Bus network for research and profit – he mentioned a guy in trinity who has access to a load of transport data and also suggested I dig out an email address of someone important at Dublin bus, and send them a formal email about gettin information about the bus, and CC him (so it looks official). He also mentioned the TextUS service based at DCU, (runs the Aircoach SMS payment service, and the SMS parking scheme) who we could collaborate with to provide a TFL type service for dublin. Gave presentation to Paddy, Davide, Neil Cowzer and Fergal Reid (clique) about my quick and dirty analysis of the dataset that I have collected allready. General concensus was that there was not really enough users, and so there were some suggestions about other datasets that might be found -persuade a mobile phone company to give data about user movements. Mine flickr/twitter for geo-tagged photo’s/tweets, and try to determine groups of people based on similar locations. Also suggested that the GMA is good for visualising data, not greatly interesting, PH is interesting as is SPD. BD is something that is useful as an application to gather data, but would need a very large engineering effort. Paddy suggested that if we could make the data collection process very easy, then we could throw it out to the student population to start collecting data. Fergal said that in J2ME it would be very difficult, but by sticking to C++ it might work (for Nokia phones). Also talked about getting ground truth for data, Fergal Suggested collecting accellorometer data too (so if someone asked – how did you verify GPS trace, one can say that we correlated it with the accelorometer data). I also suggested tagging locations. Also planned to meet Paddy again next week to go over these things, and try to hammer out a better plan. Then meet with these people again in three weeks to show where I have go to. Paddy said that in his mind, the long goal is to be able to forward plan using the knowledge of data that has passed (prediction). Looking for structures in the data – what are they? Speak to prag (network clique) to find techniques on how to extract patterns from these networks. Email Simon, Aaron and Adrian, to see if they know about, or have dealt with any large datasets which include accurate location information. In 6 weeks present to a group of people about initial findings, and ideas for further research. but beforehand, keep in sync with Paddy, and make sure I don’t go off track. Keep a record in a wave about progress. Burst Situations – emergency situations – however movement patterns are different in this case. Focus in on simple pragmatics – I want to be able to send free messages. Pick social everyday applications that justify it – (parasitic networking?). 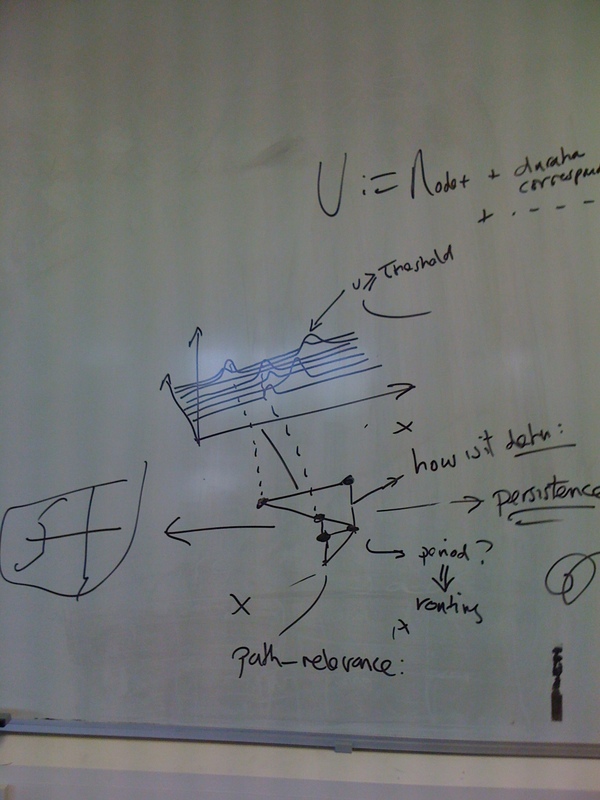 Focus on movement patterns – what recurring patterns are in there – need to data mine it all. How do we collect data, sufficiently large, and in constrained sets. Padraig Cunningham group doing network analysis – We can use Paddy’s Social network to get help with things like statistics etc. Extracitng movement patterns from everyday life – augemtnting with context information. do blind first – capture everything from individula, apply analysis just to movement informations plus simulation, then you take in to accoutn context information and see if it improves anything. Theres nothing to say that context is useful all the time. Perhaps we find it reduces the number of hops, this reduces failure rate. Chapter 1 is the broad view – DTNs Human Movent – underlying model of data transmission. my hypothersis is that human moevemtn patterns will provide an underlying model for transmission of data on ad-hoc networks. Think up and construct an experiment and do it – short term 3-4 week expt whewre we actually get somehting out of it – needs to be a small constrianed expriment, that takes into account movement and context. Looking for structures in th data what are they? Really nice to have 1 paragrah story line that we both agree tomorrow that we only change if the experiments tell us so, not just because something else comes along. Need to be able to say – here’s my definition, here’s what it means, here’s what im gonna experiment on in the next 3-4 months. hows its different from the way others people view networks? Forms the starting points of tomorrows meeting, that, we believe the first statement – that nobody has done this before. Paddy will try to find some literature to find a few rocks to throw at me! so we can defend it. If we can defend that – we can really question – we conjecture that we might be able to do the following. If we can do opportunistic routing – what do we get out of it, why is it better than what we have at the moment? I have taken on mentorship of an ODCSSS project which we have dubbed – CitySense. My student, John Paul Meaney, is currently working on plugging in movement models to TOSSIM and Tiny OS – and also implementing simple DTN protocols. We have chosen TinyOS and TOSSIM so that we are able to easily test this in the real world, to compare data with simulation data.